"The lovebird still thinks she is the most beautiful girl in the world." As the saying goes, beauty is in the eye of the beholder. 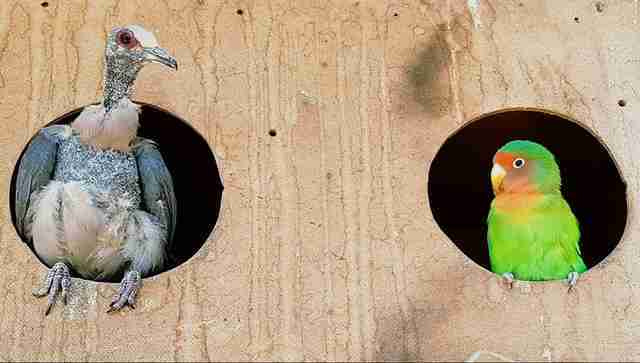 Such is the case for a lovebird named Fraser, who resides at the Twala Trust Animal Sanctuary in Zimbabwe. Fraser and his girlfriend, Pebbles, are the resident odd couple at the sanctuary, and they wouldn't have it any other way. Pebbles was first found as a fledgling in a local garden, Sarah Carter, founder of Twala Trust, told The Dodo. "She was injured and had a mite infestation so severe it caused her to lose most of her feathers," Carter said. Her extreme appearance often makes people think Pebbles is a bird of prey, rather than her actual species, a dove - which is nearly impossible to guess at first glance. "We recently had a volunteer who came to ask me what he should feed the baby vulture," Carter wrote on Facebook. "I had a blank moment and then knew exactly who he was referring to." When Fraser first met Pebbles in the sanctuary's aviary, it was truly a case of love at first sight. Fraser, who was abandoned by his previous family after after they moved, was eager to find companionship in the rescued dove. "The lovebird immediately bonded with her, bringing her food and feeding her from his beak, sleeping next to her and following her everywhere," Carter said. "They have been together for about two years now. 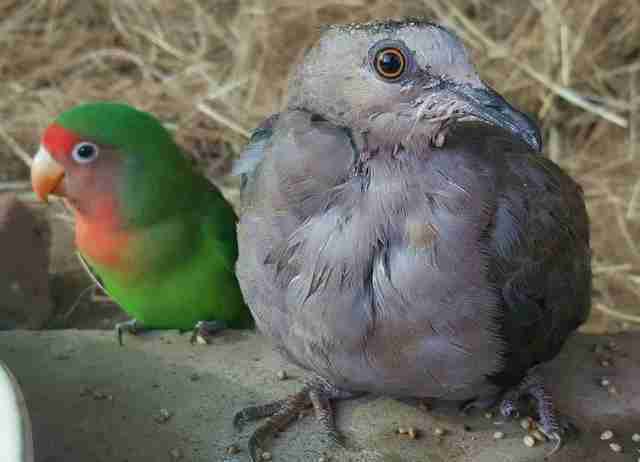 In the aviary they live in, there are other doves and lovebirds, but they seem quite content to be the odd couple." The two are inseparable - and whatever attracted Fraser to Pebbles in the first place, and vice versa, is going strong to this day. "The dove's feathers never grew back completely, but the lovebird still thinks she is the most beautiful girl in the world," Carter wrote on Facebook. 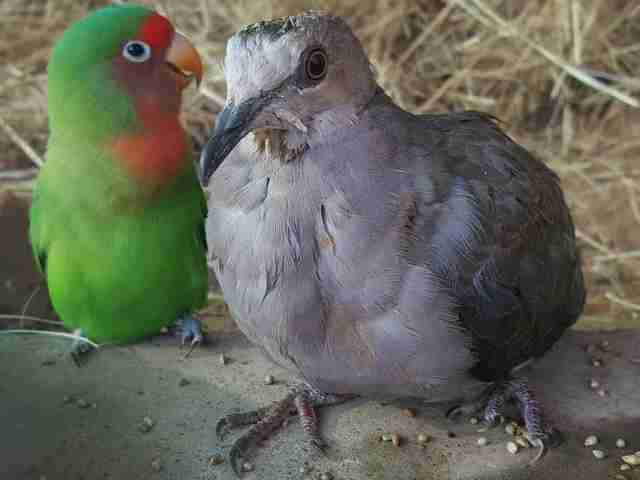 Keep up with the two lovebirds and other animals at the sanctuary on Facebook.